Fine words, as the saying goes, don't butter parsnips. When I was a schoolboy in Surrey, the Catholics used to attend Sunday High Mass at St John's Seminary, Wonersh in the newly created diocese of Arundel and Brighton. There were on average about 80 seminarians training to be priests. Now there are pitifully few. The Great Catholic Experiment of the 1960s has not worked. 'Titled “My Body; My Choice,” after one of the most popular slogans of the pro-abortion movement, the Scout program includes contact information for abortionists, contraception providing groups and detailed information on how to use condoms. It was developed for the Scouts by Brook, one of the country’s leading pro-abortion “sexual health” organizations, which advises the government. One section says, “Young people should be able to feel what a condom is like,” and says that they should know “how to put on a male condom correctly” and how to recognize if the condom is too old for use" ... what do the Catholic Bishops have to say about all this? Presumably they are horrified right? I expect they are making it very clear that any Scout group who meet in church halls belonging to Catholic churches are not to hand out condoms or use this programme...Right? Wrong. Instead they have they just issued some useless drivel about how parts of the document are 'welcome'... “The recognition given in the document to the place of abstinence in combating the problems of STIs and teenage pregnancy is welcomed. We also appreciate that Scouting recognises the importance of the religious beliefs of young people and the wishes of their parents regarding the formation being offered. The Scout Association, along with the publication of My Body My Choice, is also making available a teaching document, Cherishing Human Sexuality which sets out Catholic teaching in this area, and draws on the Bishops’ Conference document Cherishing Life. 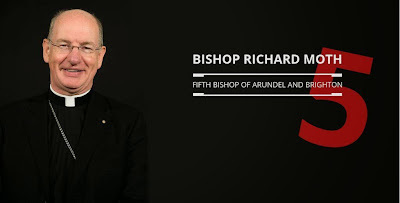 Cherishing Human Sexuality will further an appreciation of the Gospel of life, which is at the heart of the Church’s understanding of human relationships.” Bishop Richard Moth, Bishop of the Forces. Oh come on "Wake Up England" give the man a break, he's only been the Bishop a day! From what I know of him, Bishop Moth is just the man to translate fine words into action. Let us hope and pray you're right and I'm wrong. This unimportant correspondence between us here will be forgotten by everyone in five years' time (which will be 2020) but I wonder if vocations to the priesthood in A&B will have increased by then? If past performance of Bishop Moth's predecessor(s) is anything to go by, the future is bleak, I fear. Dishwashers are installed; Bishops are enthroned. Inauguration and installation are words that should strike at our Catholic sensibilities, but they don't seem to do so anymore.